"Our Pembrokeshire witness is a maiden Welshwoman, sixty years old. 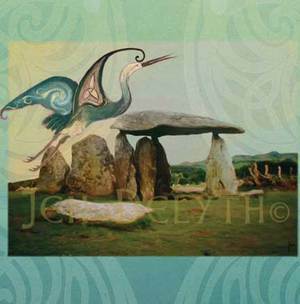 She was born and has lived all her life within sight of the famous Pentre Evan Cromlech, in the home of her ancestors. She told me 'My mother used to tell about seeing the "fair-folk’"dancing in the fields near Cardigan; and other people have seen them round the cromlech up there on the hill' (the Pentre Evan Cromlech).” Dating back to about 3500 BC, Pentre Ifan – which means Evan’s Village – was once partially covered by a great cairn used as a communal burial chamber. It was also known as Arthur’s Quoit, after the legendary King Arthur whose numinous presence is everywhere in Wales. In the midst of lovely Welsh farmlands this enigmatic dolmen overlooks the Nevern Valley, commanding extensive views. Carn Ingli, the mountain from which the Stonehenge bluestones allegedly originate, overlooks Pentre Ifan. The entire landscape is saturated in myth.